What are Cast Iron Radiators? 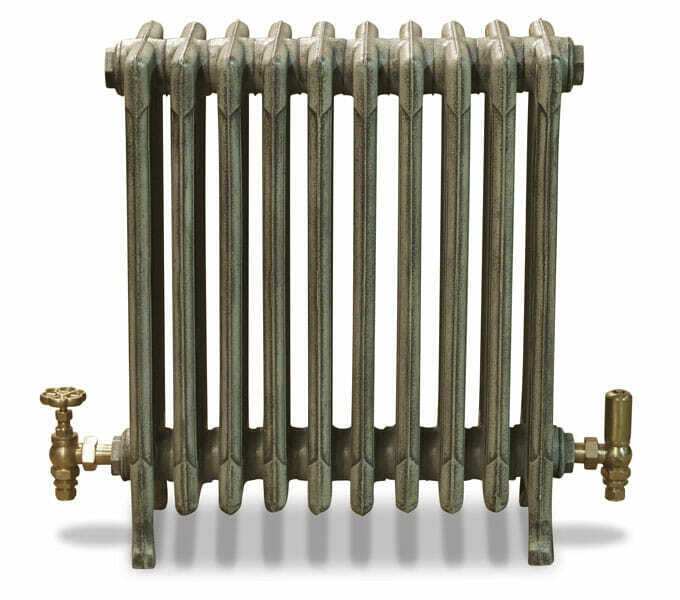 Cast iron radiators are one of the oldest types of radiators still in use today. These finned devices are designed to work with a steam system tied to a boiler or hot water systems relying on a water heater. They’re built to allow steam or hot water in and to transfer heat from the water out into the surrounding air. Cast iron radiators are one of the largest and heaviest types around. They take up a high amount of floor space and typically aren’t wall mounted because they are heavy. These units aren’t good for use in smaller rooms and can be replaced by more modern and sleeker radiators to gain space in your home. The main benefit of cast iron radiators is that it remains warm much longer than aluminum radiators and other radiators made from more conductive metals. Cast iron takes a long time to heat up, but after it reaches a high temperature it takes much longer to cool back down again. That means that rooms are heated more evenly by cast iron radiators than they are aluminum radiators. When looking for a radiator that’s going to last, there’s nothing better than a cast iron solution. Cast iron radiators are big and solid. They aren’t subject to denting or other potential damages like other radiator types are. They also rarely rust within and even if they rust on the outside they can easily be refinished and made to look like new once again. Radiators in general are highly reliable, but cast iron radiators take that reliability to a whole new level. They’re thicker and more solid than most radiators. There really isn’t much that can break on a cast iron radiator and as long as the valves and other parts of the system are maintained regularly you should expect it to continue functioning properly for longer than most furnaces or other more modern heat sources on the market today. Steam radiator systems are known for being noisy. Hisses, knocking noises and groans are all common with this type of system. Most of those noises are eliminated by a cast iron radiator. Cast iron doesn’t suffer from as much expansion and contraction as the lighter-weight solutions do. Any quality radiator must be anchored for safety. When installed the radiator should be anchored firmly into studs in the wall behind it. When anchored properly a radiator will be relatively tip-proof and will stand firmly upright during use without any risk of falling or burning floors or surrounding objects. Cast iron radiators are known for being more stylish and elegant than other types of heaters. They’re often ornately decorated and commonly have brass valves to give them a classy look. These radiators are a good solution for older homes to help keep that classic vibe that you won’t get with a more modern solution. It’s advisable to hold onto a cast iron radiator in good condition rather than upgrading, unless you absolutely need added floor space, because they’re reliable and help add charm to the older homes they’re often found in. Most people opt for aluminum or steel radiators today because they are more compact and modern, but there are still cast iron radiators for sale if you’re looking for a more traditional appearance. The radiators come with all the benefits of cast iron, but they’re big so make sure you have the space. When shopping for cast iron radiators you have two options. You can either purchase the radiator brand new, or you can obtain an older radiator and clean it up and refurbish it, or obtain a refurbished model from someone else. If you’re adding a radiator to your home make sure you buy the proper size. To figure out which size to purchase it’s important to consult with a plumber or a heating specialist. Often you can go by the size of the old radiator if you’re simply replacing a worn out unit, but when buying a radiator for a room for the first time it’s vital that it’s sized properly. This takes some calculating to get right. A properly sized cast iron radiator can be one of the most pleasant ways to heat a room in your home. Not only does it have a classy look to it, but the solution offers very even heat that won’t generate uncomfortable hot and cold spots throughout the room. Sure cast iron radiators aren’t the most modern and there are more efficient heating solutions on the market, but they’re highly reliable and can be depended on to offer heating for decades in most instances.